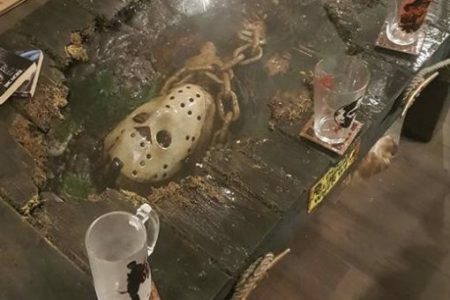 An amazing custom coffee table encasing Jason Voorhees by The Devil’s Latex. How will you scare the pants off of the people you live with? Check out this cool Zombie Hand Sticker from Storkz. This awesome sticker will give your house guests a fright this Halloween when they go into the bathroom. Who says pirates don’t turn into zombies? Not us. Check out this ladies zombie pirate costume from FunFancyDress.This halloween try something a little different and totally own it this year. Zombie loving women, try out this awesome costumer from FunWorld.This cool Living Dead costume will have you winning your costume game this Halloween. Try and beat all your friends with your perfect zombie transformation. The Zombie Containment Unit by Hi-Rez Designs takes Halloween props to the next level using a combination of digital and practical effects, animatronics and video.